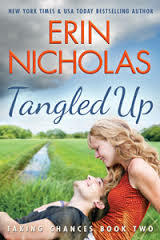 This was my first time reading a book by Erin Nicholas and I enjoyed her writing and the unique idea of storm chasers. She managed to make the reader understand the after effects of a natural disaster on a community and really gets the reader thinking of crisis management. I loved the dominant side of Max's character as well as his sweet, romantic and protective side, however I hated the fact that he was trying to change Bree to fit his idea of the correct girlfriend and he was always so judgemental towards Bree and her actions. Bree's character was strong and independent, but she could never seem to commit and always seemed so confused which was annoying. I loved the chemistry between Bree and Max because it was sizzling hot and the way their friendship flowered into love was beautiful. I did feel that the chapters were too long and that the characters were so confused about their feelings that they kept on going back and forward which became very boring and irritating. This was a good book and I look foward to the rest of the series. Max Grady, a storm chaser, is back to his home town Chance for his high school reunion, when he can feel that a tornado is about to hit his beloved town. He decides to chase after the storm and he asks his best friend and adrenaline junkie Bree McDermott to join him. Max has always been secretly in love with Bree and when they are stuck in the tornado and end up kissing a whole bunch of emotions come to the surface. Bree is always looking for excitement and her next adrenaline rush and when their kiss fufills her with that rush, she decides that she wants more. As Max and Bree work together to clean up the aftermath of the tornado, their attraction begins to hard to ignore. Will Bree and Max be able to get over their insecurities in order to find love?